Due to the juxtaposition of lowland tropical rain forest and coral reefs, the Bocas del Toro Biological Station offers a tremendous biodiversity found at any one location. This high biodiversity translates into exceptional opportunities for the student, researcher, and amateur naturalist. Tropical Lowland Rainforest is the most common vegetation type in the archipelago and represents the most biodiverse terrestrial ecosystem on earth. Both primary and secondary associations are present near the station. Primary forests are lofty with a canopy reaching 120 feet above the ground, and emergent species, such as the kapok (Ceiba pentandra) almendro (Dipterex panamensis) and prioria (Prioria) to 200 feet or more. Canopy species are diverse with leuhueas (Leuhea seemanii), nutmegs (Virola) and figs (Ficus) being prominent. 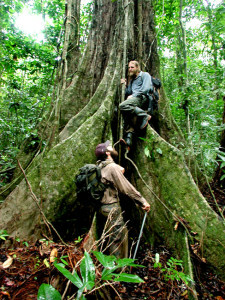 Figs in particular are vitally important in Neotropical forests because they function as “keystone” species. Keystone species are so important to the functioning of ecosystems that their removal would cause ecological collapse. There are 3-4 levels of subcanopy and a relatively open ground layer grown to many species of aroids (Dieffenbachia, Philodendron, Monstera), ferns, palms, cycads, and many seedlings or saplings waiting for their moment in the sun. Epiphytes are abundant here too. Monsteras and philodendrons creep up every trunk and lianas, some as large as a person’s thigh, drape from canopy to ground. Bromeliads, orchids, and woody epiphytes are abundant especially on ceibas and other emergent species. Secondary rainforest associations are very different. Being young, they support many early herbaceous, successional and sun-loving species like heliconia (Heliconia), pepper, (Piper) ginger (Costus), Panama hat palm (Cordulovica), and many other species. The effect is the dense, overgrown “jungle” of lore, and more difficult to move through than primary forests. Each successional phase has its own set of associated animals. Many amphibians and reptiles are found here including four species of poison-dart frogs (Dendrobatidae), six species of anoles (Polychrotidae), and many species of snakes including the Boa constrictor and green parrot snake (Leptophis). The poison-dart frog, Dendrobates pumilio, is exceptionally abundant in primary forests throughout the archipelago and represent an important draw to the region. As a result of isolation over the last 8000 years, each island has developed its own unique color morph. 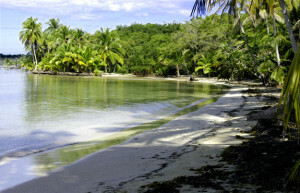 Consequently, the Bocas del Toro Archipelago has frequently been called the Galapagos of Central America. 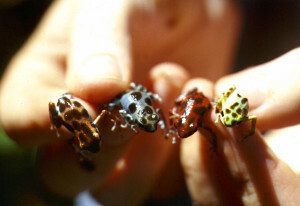 Our particular color morph is lime green with black spots and bright yellow underneath. Red, white, orange and blue morphs occur on other islands of the group (Bocas Poison-dart Frogs). Large and colorful insects are here too such as electric-blue morpho butterflies, gigantic rhinoceros beetles and foot-long stick insects to name a few. 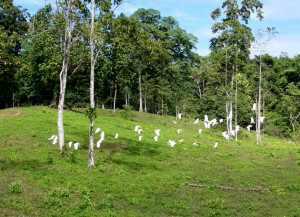 Birds are abundant in primary and secondary forests. These include two species of manakins, two antbirds, trogons, hummingbirds and five species of parrot. Raptors, too, are common here such as the common black hawk, roadside hawk, white hawk and plumbeous kites. Mammals are diverse in rainforest ecosystems but most are only observed at night. Howler monkeys and white-faced capuchins are frequently encountered here as are sloths and occasionally, silky anteaters. In the late afternoon agoutis (Dasyprocta) which look like guinea pigs on stilts, become active and can sometimes be glimpsed along trails and streams. Raphia-Symphonia Swamp Forest lies seaward of the lowland rainforests and grows on low lying and often flooded peat substrate. This forest is characterized by gigantic Raphia palms (Raphia terdigita) which have the distinction of possessing the longest leaf of any plant in the world, up to 40 feet length! Previously it was believed that raphia palms were brought to the New World in the 15th century along with the slave trade because their seeds were eaten by slaves onboard ships to the Americas. However, in 2003 our pre-Columbian archaeology project in Boca del Drago discovered a cache of charred raphia seeds carbon dated to about 1000 years before present, long before discovery of the Americas by Europeans. 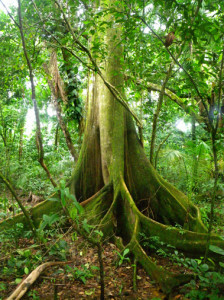 Besides raphia, canopy species includes large figs (Ficus) and Symphonia, a lofty tree with amazing adventitious roots emerging from the trunk and neon yellow sap. Bright red symphonia flowers and fruits are important foods for monkeys and other wildlife in these forests. The overall canopy is low, only about 50 feet in height. The understory is thin and the ground layer is dense with the aroid Spathephyllum latispatha, ginger (Costus), and other herbaceous plants. Both howler and white-faced capuchin monkeys are abundant here and the low canopy allows for superb viewing. Birds are also abundant in the raphia forest along with many amphibians and reptiles. Swamp forest mammals are often difficult to see but they commonly leave their footprints in the mud for us to identify. Savannah-like Pastures are important habitats in our area. Unlike pasture conversion elsewhere, folks in the Bocas area like to leave in place many of the larger trees, such as ceibas, almendros and figs. This provides a savannah-like habitat that attracts many species of animals, particularly birds and insects. The ecotones created between pasture and forest are some of the best places for observing wildlife such as pacas, monkeys and birds. Three-wattled bell birds are often seen here making their loud and bizarre call from the top of large trees. Plumbeous kites and Montezuma’s oropendola frequently nest in isolated pasture trees. 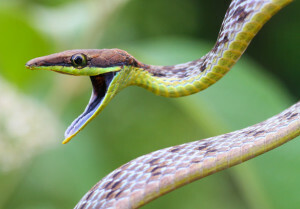 Reptiles in general are rare here, but green (Leptophis) and brown vine snake (Oxybelis) are very common. These pastures are also important in terms of forest regeneration. Each tree that remains becomes a pivotal location for birds passing through the area and they often leave their seed-laden droppings behind. The solitary trees become islands of secondary vegetation and, with time, grow in size and ultimately coalesce into continuous forests. ITEC’s Tropical Rainforest Restoration project concentrates on replanting these sorts of areas. Hardwood Swamp Forests are low-lying forests without a peat substrate. Raphia rarely grow here. Instead, these swamps are home to various tree species with large, complicated buttresses that support these huge trees on swampy terrain. 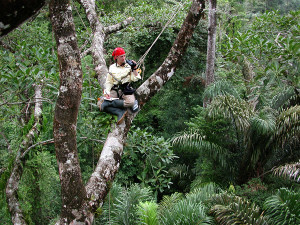 Canopy height can reach 150 feet. The understory is very sparse and generally, open water spans the distance between tree buttresses. Spathephyllum and leather fern (Acrostichum) emerge out of the water and philodendrons grow along the trunks. 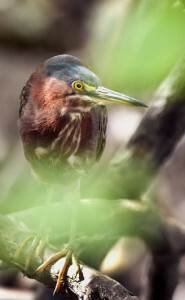 Hardwood swamp forests are favorite daytime haunts of black-crown night herons, caimen and field-hardy biologists! 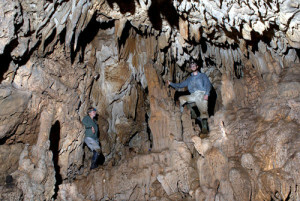 Limestone Caves represent a unique and incredibly important habitat on Isla Colon. There are at least 30 known caves on the island, and probably many more exist. Most of the caves have streams running through them and all are “live” caves. This means that they are still growing as water percolates through the limestone. The limestone is composed of ancient coral reefs dating from Pliocene and Miocene times, 5 to 20 million years ago. Since then the region has been uplifted to the island’s present height of 80 feet above sea level. Now above the sea, these caves continue to enlarge as slightly-acidic water dissolves minerals from the rock and re-deposits them as stalactites, stalagmites and other fascinating formations. Many of the caves are easily accessed by walking into them, some have to be waded into and for others, it is necessary to crawl through a small opening on your hands and knees. Cave streams contain several species of fishes including tropical shiners (Characinidae), freshwater eels (Synbranchidae) and a catfish (Ictaluridae) that we have only seen in caves. There are also giant shrimp (Macrobrachium) that reside in these waters. Looking more like crawfish, this crustacean can reach a foot in body length and have forearms and claws twice that length! Spectacled caiman are also occasionally found in the deeper pools of caves. The walls of the caves are also alive with wildlife. Cave crickets are everywhere on the walls and ceilings along with their primary predator, the bizarre-looking amblypygid. Amblypygids, sometimes called “whip scorpions” are primitive arachnids that look dangerous, but are completely harmless. Several mammals make use of caves such as the giant spiny rat, or opossum. 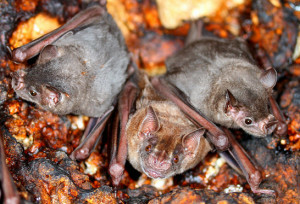 But bats are by far the most abundant mammal inhabiting area caves. Many species occur here including fruit bats (Artibias, Phyllostoma), nectarivores (Lonchophylla), fishing bats (Noctulio), insectivorous bats (Sarcopteryx), vampires (Desmodus) and others. In places fruit bats will literally cover every square inch of the cave’s ceiling. Boa constrictors are frequently encountered in these caves as well, where they lie in wait for passing bats or spiny rats. Several caves are found only a short distance from the field station. Marshes are abundant habitats in our area and home to many species of birds, amphibians and the spectacled caimen. 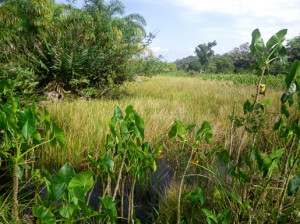 A large Eleochris (a type of rush) marsh lies between the field station and raphia forests. Freshwater eels are common here as are several tree frog species (Hylidae) which breed in marshes. The avifauna utilizing marshes in our area display unique social behaviors. Most common is the groove-billed ani which forms small flocks of 3-10 individuals all of whom are related to one another. These birds engage in cooperative rearing of siblings by the previous year’s brood; a rare phenomenon in nature and known to exist in only a few bird species. Polyandry is also very rare in nature and represents a type of breeding system exhibited by another marsh resident, the northern jacana. In a polyandrous system, a single female will maintain a harem of several males and it is the male that build nests and rear the young. Northern jacanas can also be found along rivers and lakes. Many kinds of insects may be found in marshes as well, including the colorful, aposematic lubber grasshopper. 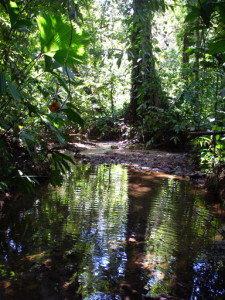 Stream and River ecosystems are abundant in the area as one would expect with the amount of precipitation we receive in Bocas. Several small streams are found near the station and provide unique habitat for a variety of plants and animals. Several species of freshwater turtle, such as mud turtles (Kinosternon), tropical wood turtles (Rhinoclemmys), snappers (Chelydra) and sliders (Trachemys) are found in area streams. A large variety of tropical fish are also present including top minnows (Poeciliidae), shiners (Characidae), cichlids (Cichlidae), sleepers (Eleotridae), freshwater eels (Synbranchidae), and freshwater pipefish (Signathidae) which are essentially stretched-out seahorses. The Mimbitimbi River, actually a large creek that flows from the mouth of Mimbitimbi Cave, represents the largest stream on the island of Colon. Located on the mainland north of the field station, the Changuinola River represents the largest riverine system in the area. This rocky-bottomed river is several hundred feet across and widens to one kilometer at its mouth on Soropta Beach. This creates a large estuary that is an important fish nursery and fishing location for many local inhabitants. A large variety of fish can be caught here including tarpon, snook, cobia, kingfish, mackerel, snappers, and others. Estuaries are also great places to encounter shore birds (sand pipers, whimbrels, plovers and curlews), wading birds and the American crocodile. The West Indian manatee (Trichechus manatus) can also be found in these waters and associated sloughs. Ponds and Lakes represent the remaining freshwater systems located near the field station. These vary in size from a few square meters to several hectares. Smaller ponds and vernal pools are important frog breeding sites for species such as red-eyed tree frog (Agalychnis callidryas) and many other species of treefrogs. 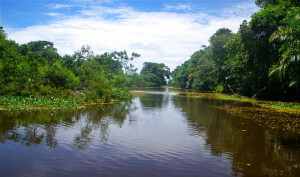 The larger ponds and lakes represent important habitat for fish, caimen, turtles and wading birds, and is breeding habitat for northern jacanas. Small islands located in some ponds are used as night roosts by large flocks of herons and egrets, and are vital nesting habitat for groove-billed anis. A large variety of marine systems occur at the field station including beaches, mangroves, rocky intertidals, sea grass beds and coral reefs. The broadest beaches and rocky shorelines occur on the seaward side of the island while the protected leeward side contains most of the mangroves and coral reefs. Beaches in our area come in both in both high and low impact varieties. High impact beaches, like those found at Bluff and Mimbitimbi, are directly open to the Caribbean Sea and not protected by a reef system. These beaches tend to be broad and represent important nesting locations for sea turtles, particularly leatherbacks (Dermochelys coriacea) and hawksbills (Eretmocheleys imbricata). The leatherback is by far the most common in our area. Its nesting season extends from March to June with peak activity occurring in April. Low impact beaches are those that are protected by reef development off shore, or occur on the leeward side of the islands. These tend to be narrow in width and have quite, clear water in the lagoons between the shore and the reefs. 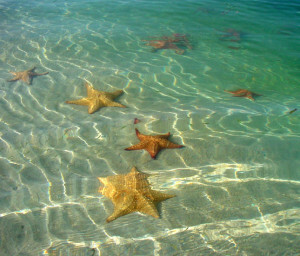 Both types of beaches support a large number of specialized plants and animals. Important plants include the beach morning glory (Ipomoea pes-caprae), sea grape (Coccoloba uvifera), coco-plum (Chrysobalanus icaco) sea hibiscus (Hibiscus), beach almond (Terminalia catalpa) and of course, coconut trees (Coco nucifera). Important understory plants include beach ginger (Costus laeveus), elephant ear (Aracea), cycads, beach lilly (Hymenocallis) and numerous other species. Ghost crabs, various land crabs and hermit crabs abound here and form distinct zones of occupation as one moves away from the sea. The abundant driftwood and shoreline vegetation provide habitat for race-runner lizards (Ameiva quadrilineata), Jesus Christ lizards (Basiliscus vittatus) and for the Boa constrictors that come in search of them. Mammals can also be found here such as the anteater, tamandua (Tamandua mexicana), crab eating raccoon (Procyon crancrivora) and variegated squirrel. The two-toed sloth (Chilopus hoffmani) is very abundant particularly in the beach almond trees along these beaches. 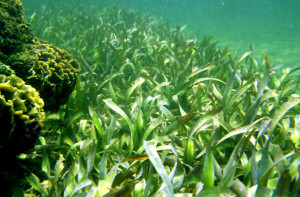 Seagrass Beds lie between the reef and shore and support very healthy stands of turtle grass (Thalassia tesdudinum) and manatee grass (Syringodium filiforme). These shallow, warm waters provide habitat for a variety of small fishes such as sardines, puffers, mullet and flounders as well as crabs, sea urchins and sea horses. As green plants, sea grasses represent important primary producers that fix the sun’s energy for use by the reef. Various green algae species are common here too, such as Penicillus and Halimeda. Seagrasses are also the primary food for both green sea turtles (Chelonia mydas) and West Indian manatees. Rocky Intertidals represent another important marine habitat available for exploration. As elsewhere, rocky intertidals show distinct zonation where marine organisms occur in bands parallel with the water. There are four such zones in the Caribbean, including (from the water up) the brown, yellow, red and black. Each zone has its specific organisms such as algae, chitons, limpets, periwinkles, barnacles, snails, bryozoans, and crabs. 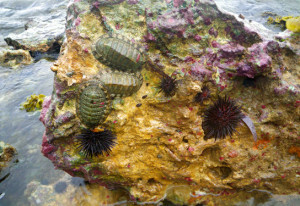 Various fishes, like gobies and flatfish, can be found in tide pools along with sea stars, sea urchins, octopi, and large variety of crustaceans. The very active and colorful sally light-foot crabs (Graspsus) can be seen dashing across the rocks near the water. Bird Island, only 15 min. from the station, demonstrates these zones vividly. Coral Reefs abound in the Bocas del Toro Archipelago. A diverse fringing reef exists 30 meters in front of the field station. This is a “high-energy” reef and receives wave action directly from the Caribbean Sea. Many Caribbean reef creatures can be found here including corals such as finger (Porites), lettuce (Agaricia), brain (Diplora) and endangered elkhorn (Acropora). A multitude of colorful sponges also occur here as well as sea anemones (Condylactis), sea fans (Gorgonia), feather dusters, sea stars (Oreaster), brittle stars (Ophiocoma) and sea urchins (Arbacia, Diadema). 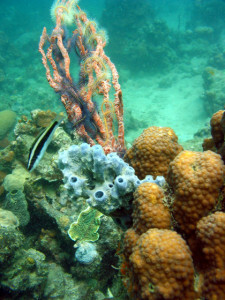 Several species of octopi are regularly encountered as are cones, conchs and scallops. 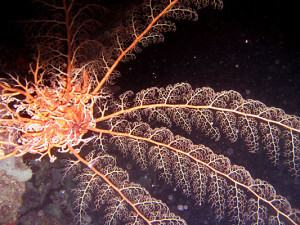 Spiny lobsters and many crab species can be found lurking in the nooks and crannies of the reef. Marine fish are abundant and include many brightly colored forms such as the blue-headed wrass, sergeant major, butterflyfish, damselfish, parrotfish, gobies, angelfish, moray eels and many others. Some interesting species include trumpetfish, barracudas, spotted eagle rays, jacks of several species and nurse sharks. Coral reefs are also found associated with mangrove forests on the leeward, bay side of the island. Having these reefs nearby is extremely advantageous. During stormy conditions when the sea in front of the station is rough and the water murky with suspended sediment, the quite waters of the bay remain calm and clear. Good conditions for exploring coral reefs are, therefore, always available to us regardless of the weather. These bay reefs are very diverse and can actually extend in some areas right into the mangroves. Lettuce, finger and brain corals are abundant and the endangered staghorn coral is present as well. Sea fans, coral heads, cushion stars, sea urchins, sea slugs, sea horses and several species are sea cucumbers are very common. The many species of brightly colored sponges on this reef are literally swarming with brittle stars and the unusual upside-down jellyfish (Casiopia) that congregate in the calm waters behind the reef. From here, one can swim directly into the mangrove roots which harbor a multitude of marine plants and animals (see “Mangrove Forests” above). At night, filter feeding sea baskets (Astrophyton muricatum) and flamingo’s tongue cowries (Cyphoma) emerge onto sea fans to forage, as do the lobsters, crabs and other nocturnal animals of the reef. Mangrove Forests represent one of the more fascinating and ecologically-important forest types in the area. There are four species represented here, including red mangrove (Rhyzophora mangle), black mangrove (Avecinnia radicans), white mangrove (Luguncularia racemosa) and button bush (Conacarpus). Red mangrove, with its gracefully arching prop roots, is most resistant to wave action and generally forms a thick band along the water. 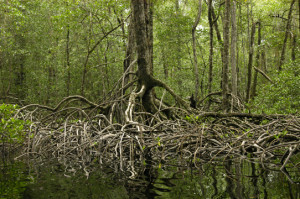 Black mangrove is found in calm water behind the red mangrove band and can be identified by its straw-like pneumatophores, aerial roots used to absorb oxygen. White mangroves represent the most landward species and are large trees with light, scaly bark. 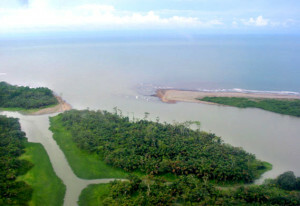 Thousand of small mangrove islands dot the region. A distinctive ring of larger trees can be seen from the air encircling these islets. The larger mangroves on the edges are due to the limiting effect of phosphate, a relatively rare mineral nutrient in these waters. The outside edge of mangrove trees filter out much of the phosphate for themselves, causing those plants in the interior to be somewhat stunted. Mangroves are very important to the nutrient cycles and energy flow on coral reefs as derived from the decomposition of mangrove leaves. In our area, some coral reefs are found among the mangroves. Mangrove roots serve as important nurseries for many fish species and clouds of sardines can be found among them. Mangrove roots are literally encrusted with all sorts of marine invertebrates, such as sponges, sea squirts, scallops, oysters, hydrozoans, and the occasional seahorse. 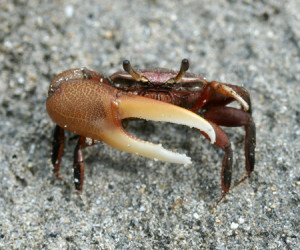 Mangroves host a large variety of animal species including the endemic mangrove crab, mangrove snail and mangrove oyster, as well as many non-endemics, such as the fiddler crab. Vertebrates include the American crocodile, a host of birds such as night herons, egrets, mangrove warblers and greater potoo, as well as monkeys and sloths. Estuaries. Where freshwater rivers and streams meet the sea creates one of the most important ecosystems found anywhere. The reasons are simple. Lotic systems (moving water such as steams and rivers) are the transporters of mineral nutrients leached from the land. Since the water is moving, nothing stays put and all of these nutrients end up in estuaries. Primary production (conversion of solar energy to chemical energy via photosynthesis in plants) is very high in estuaries as algae take full advantage of the mineral nutrients that often lacking in marine systems. Consequently, such areas are biologically very rich and vitally important as breeding grounds for many marine fishes and invertebrates. 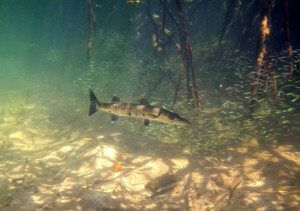 A variety of large fish lurk in these waters too, such as snook, snapper, tarpon, kingfish, and several species of shark. Tropical estuaries are favorite haunts of the American crocodile. These crocodilians are the largest in our hemisphere and can often be seen hauling out on sandbars at river mouths. A multitude of wading birds can also be found foraging along shore and manatees regularly pass through estuaries during their movements between fresh and salt water. Both small and large estuaries our found in our area, the largest occurs at the mouth of the Changuinola River, about 25 minutes from the field station.